The Sun Just Unleashed The Most Powerful Solar Flare In Decades and It Has Major Effects on Your Health! Is nature trying to send us a message? Fires, floods, major hurricanes and now one of the biggest Solar Flares in decades has hit the Earth. On Wednesday morning the sun has unleashed the most powerful category of solar flare, disrupting communications and creating wide area of blackouts as Hurricane Irma wreaks destruction across the Atlantic. The sudden blast of energy was sent out by the sun and could interfere with radio and satellite communications as it passes by Earth, experts warn. The flare was the strongest in a decade, and blasted out from a sunspot on the Earth’s surface. It belongs to the X-class of flares, the most powerful possible. 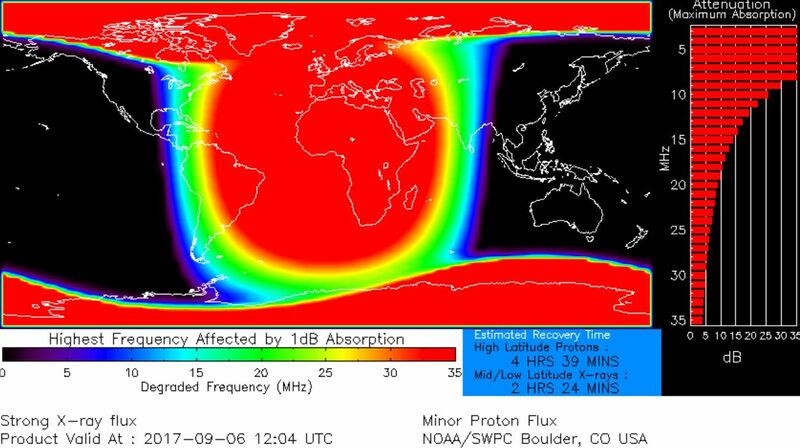 Nasa’s Space Weather Prediction Centre (SWPC) said that the energy of the flare had knocked out radio communications with Earth, which led to blackouts and loss of contact for up to an hour. It led to a “wide area of blackouts, loss of contact for up to an hour over [the] sunlit side of Earth” and hit systems that are used for navigation, the agency said, reports Independent. Some people theorize that the flare might ramp up Hurricane Irma and Hurricane Jose. But scientists haven’t confirmed what the combination of both could do. However, scientists have noticed correlations between solar flares and people’s moods. They say the solar storms can desynchronize our biological clocks and effect a gland in our brain that controls sleep. So if you feel super sleepy right now might be because the Solar Flare blast is throwing your internal clock all out of whack. The solar flare can also cause headaches, palpitations, mood swings, and just a general feeling of being unwell. Your thinking feelings confused and chaotic and there’s a chance of increased erratic behavior. People who are good at reading energy say that this sudden burst of light photons has a purpose to accelerate the raising of our consciousness and awaken us to see how our actions have a negative effect on the world we live in. Scientists have repeatedly warned that we are lucky not to have been hit by major solar storms that cause even more damage to communications. In 1859, for instance, the Earth’s magnetosphere was hit by a powerful blast of energy referred to as the Carrington event, and scientists have warned that another such event could happen, this time with far more disastrous effects. Maybe nature tries to warn us that our actions have consequences, and remind us that we should take better care of the planet we live in!